Here’s a dozen for you! Is there someone in your life that you would like to impress, congratulate, or show gratitude? Flowers are always a good choice but EDIBLE flowers? Oh my! These beautiful sweets look ever so complicated but they are really quite simple. Yes, they take some time but when you (the “giver”) see the reaction of the recipient (the “givee”), it will be worth every minute. 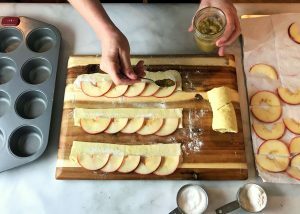 The basic recipe requires red apples, crescent dough, cinnamon/sugar, a rolling pin and a muffin tin. Seriously, that’s it. You can go to the next level with a filling like I used for this post … golden raisins macerated in white wine and spices and then pureed … or try peanut butter, Nutella, or caramel sauce … all based on what you think the “givee” will like! 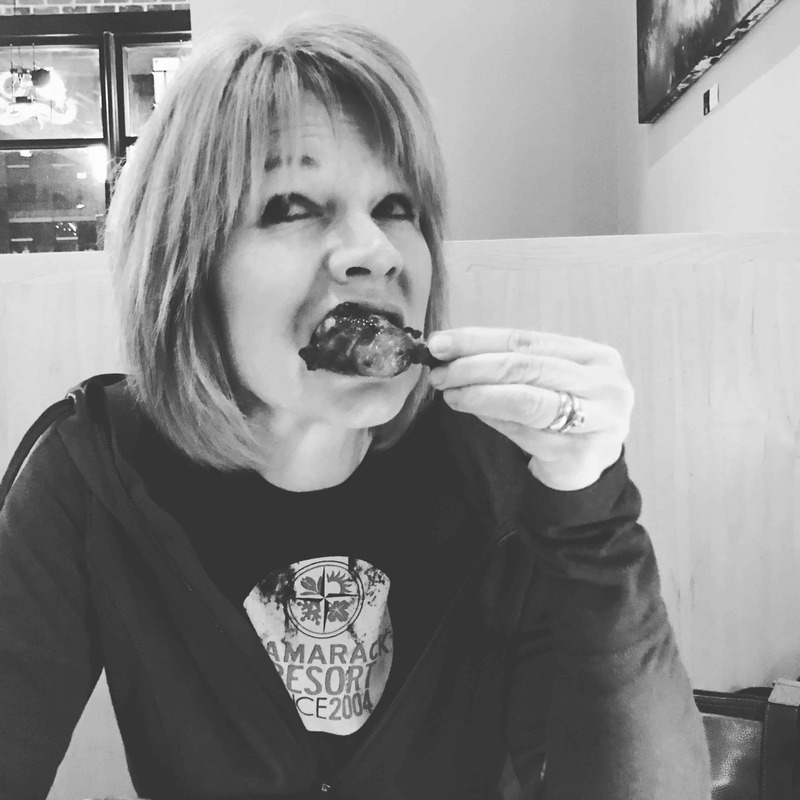 To give you every opportunity for success with this process, I asked my youngest son to come home and take pictures and video for this post (Photo Credit: Marcus). Here we go! 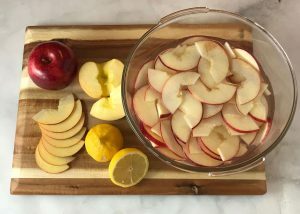 Step 1: Wash 3-4 (depending on size) red apples, cut in half, remove core as pictured, and slice into very thin (1/8″) semicircles. Discard (i.e. eat) end pieces. You will need 60-70 semicircles. Place in a bowl of cold water (enough to cover apples) with the juice of one lemon. Step 2: Microwave apples in lemon water on high for 4-5 minutes or until apple pieces are flexible and do not break when bent. Remove from water and dry on paper towels. Set aside. Step 3: Open the tube of crescent dough and unroll two triangles (or one rectangle) and place on a floured surface. 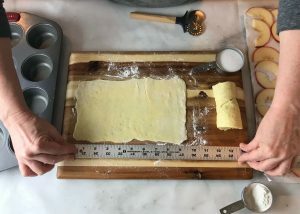 Using a rolling pin, gently roll dough into a 9″x6″ rectangle. 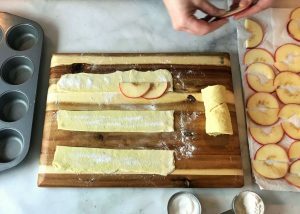 Step 4: Using a pizza/pasta cutter or a knife, cut dough into three strips (9″x2″ each). 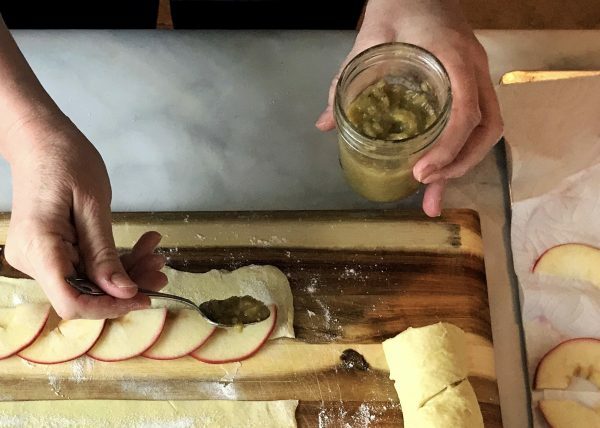 Move dough strips a few inches apart. Step 5: Sprinkle dough with sugar (and cinnamon, if you want just a simple cinnamon/sugar rose). Step 6: Lay 5-6 slices of apples, overlapping as shown on the top half of each strip (notice I am working from the top of the photos). 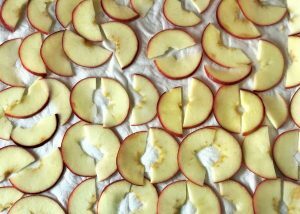 Start and end the apple slices about 1/2″ from the end of the strip. Step 7: Spoon a thin line of filling (recipe below), peanut butter, Nutella or caramel at the base of the apples (the center of the dough strip). Step 8: Fold bottom half of the dough strip up and over the apples and filling. Press down gently to secure in place. 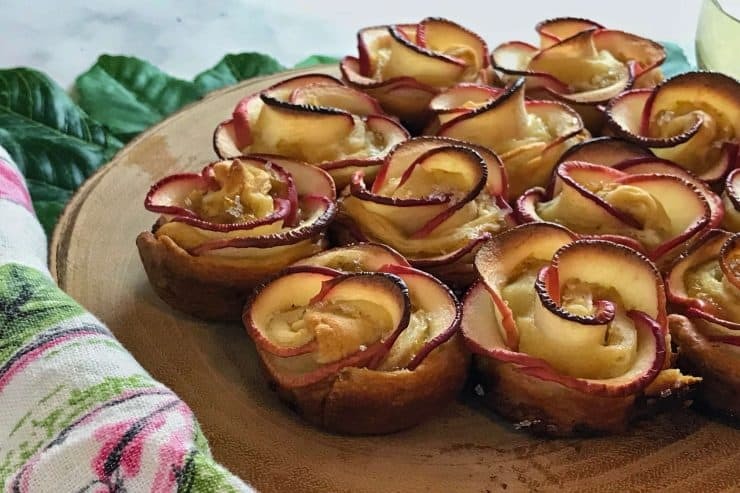 You should see the rounded tops of the apples sticking out from the dough edges. Step 9: Video time! 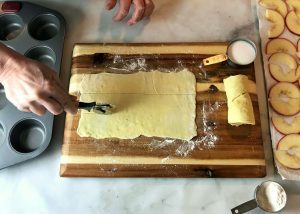 Gently roll up the dough from one end to the other. Focus on the spiral dough end as the video perspective shows. This will make for a nice, flat bottom to the rose. 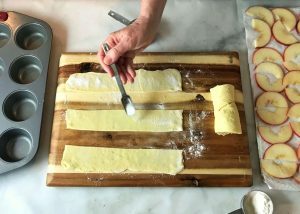 If you have trouble securing the dough at the end of the rolling process, spread a little melted butter on the end to keep the dough from unraveling. 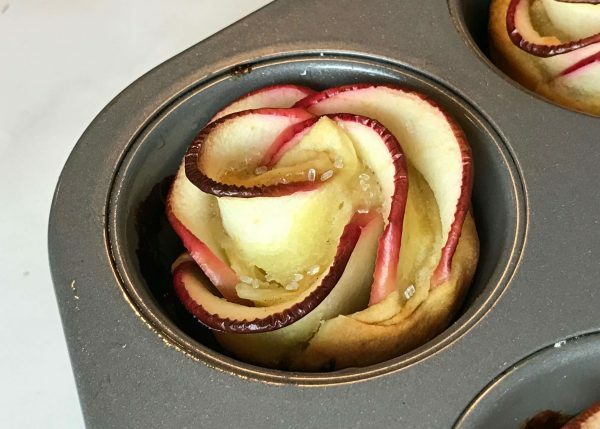 Step 10: Place each rose in a well buttered muffin pan and bake at 375 degrees for 10 minutes. Lower the oven temperature to 325 degrees and continue baking for 30 minutes. Remove from oven. 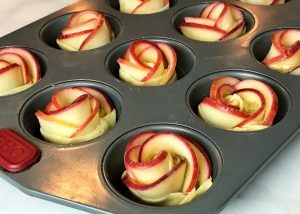 Use a thin knife to go around the outside of each rose, loosening it from the sides of the pan. Allow to cool for 2-3 minutes before removing roses to cooling rack. 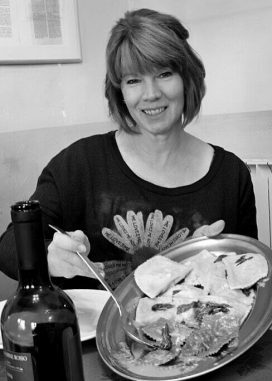 What better paring for roses than wine? And what is a raisin but a dried grape? 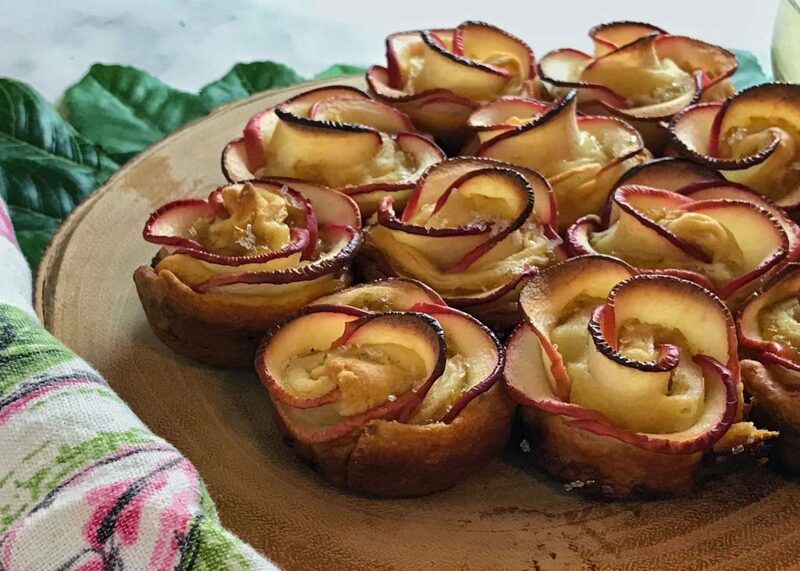 This is a perfect filling to compliment the apples without overpowering their sweetness. Combine all ingredients in a microwave-safe bowl and cook on high for 1 minute and 30 seconds. Remove from microwave, cover and let sit for 30-60 minutes. Put all ingredients in a food processor and puree until smooth. Allow to cool completely. I have also made this recipe using pie crust which is AMAZING. The crescent dough is more forgiving when rolling. 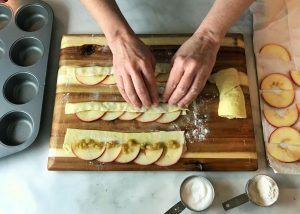 There are other recipes that use phyllo dough which I’m sure is fantastic … I just don’t have good luck with it for whatever reason. The goal here is not to create a culinary masterpiece (although it comes close). The goal is to make something by hand to show someone else how much they mean to you. Skip the card … maybe add a single rose and a bottle of white … and deliver it personally. Gifts that nourish the soul are the best gifts. 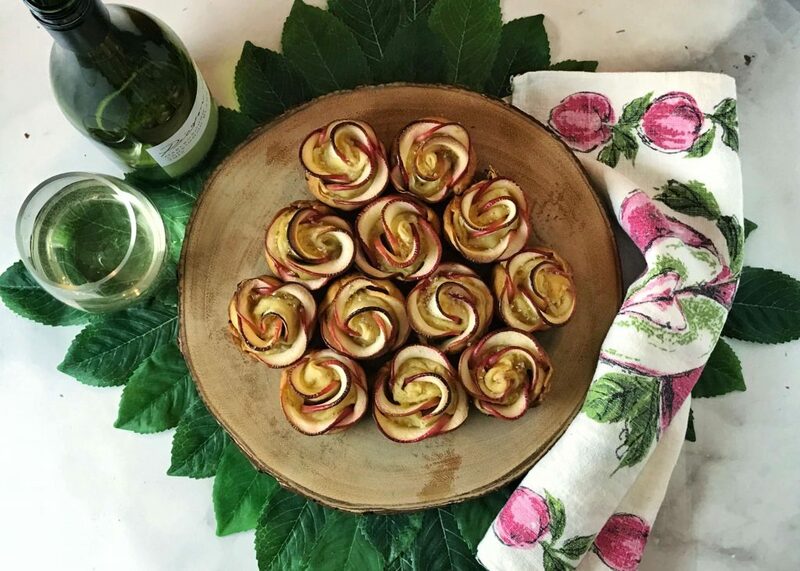 Who wouldn’t love a dozen of these homemade Apple Roses? 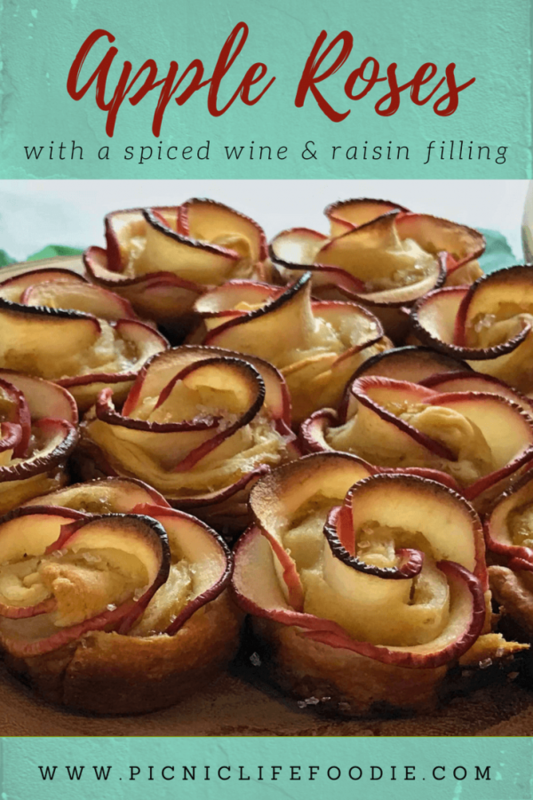 Simple, beautiful, delicious and filled with a white wine and spiced golden raisin puree. These look both delicious and gorgeous! Thanks for sharing! You are welcome … they really are fun to make!